Central America: The country of Panama holds a unique strategic geographic location, and it has tried its best throughout the ages to exploit this to the full. From the time of the Portobello fairs to the first transisthmian railroad to the present waterway, often considered to be the eighth wonder of the world. A canal linking the Atlantic with the Pacific oceans had been a dream since the first Spanish colonizations. In fact it was Charles V of Spain who first envisaged a shortcut through the Panamanian jungle to ease the difficult crossing. So in 1524 he ordered a survey of the land. However what inspired the king initially was not so much the possibilities for trade, so much as how to bring back to Spain with least difficulty the hoards of treasure recently discovered in Peru. Unfortunately for him, earth-moving techniques were to need major improvement before his idea could be undertaken. It was not until 1826 when the United States started investigating a treaty with South American countries to "protect the companies intending to open a communication system between both oceans". It was at that stage when the building of a canal attracted worldwide interest, with France, England and the United States looking for locations and means to avoid the long, difficult and dangerous voyage around Cape Horn. The first attempt at this was the construction of the Transisthmian Railroad in 1855, which eliminated about 8,000 miles from the journey. The first attempt at a canal was in 1854 by a multinational expedition comprising the United States, France, England and New Granada. But the impenetrability of the jungle was to take its toll and the attempt failed with many resultant deaths. But not to be daunted in this most crucial endeavor, in 1878 the French obtained a concession from Colombia to build a waterway. Yet again, after seven years of fighting disease and other jungle problems, the attempt was to fail with yellow fever, malaria and various plagues holding sway. This project, with the idea of building a level canal, was ultimately abandoned at the turn of the century. Eventually the creation of a canal was to become a military imperative for the United States who commenced (fruitless) negotiations with Colombia in 1902. Finally, Panama declared its independence from Colombia in 1903 and the project went ahead. The monumental construction took 10 years to complete at a cost of $387 million. 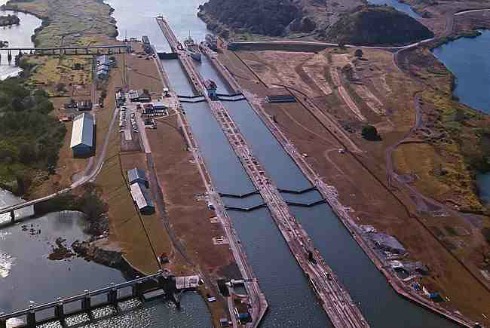 The Panama Canal is 50 miles in length running from northwest to southeast. About 8 hours is needed for a typical vessel to transit the canal, whilst being lifted gradually to a height of 85 feet through three sets of locks – the Gatun, Pedro Miguel and Miraflores. Operating the gigantic locks consumes vast amounts of fresh water. For every ship passing along the waterway, around 52 million gallons of water flows into the locks then out to sea. This comes from the Gatun and Madden lakes. The lock gates, themselves engineering wonders, consist of pairs of towering leaves from 47 to 82 feet high, 65 feet wide and 7 feet thick. Their weight is from 400 to 700 tons, yet each can be opened or closed in 2 minutes, powered by electric motors. To navigate the canal, a ship’s captain must relinquish responsibility for his vessel to a Panama Canal Pilot. Currently over 250 pilots steer over 14,000 ships through the canal each year. The total time spent in the canal is around a full day. Navigating through the canal is not cheap for vessels, averaging several 10s of thousands of dollars, depending upon the size of vessel and its contents. However, whatever the toll, it is typically ten times what it would have cost to navigate around Cape Horn. The Panama Canal Commission welcomes visitors at the Miraflores Locks on the Pacific side of the Isthmus seven days a week, from 9am to 5pm. Ships passing through the locks can be viewed from a pavilion where commentators provide an English and Spanish-language commentary, giving all the details of the canal including the amazing statistics. From yachts and small crafts through to container vessels, huge cruise liners and even small submarines, the Panama Canal is truly an international crossing point.